Mats capture dirt, liquids, germs, and debris. It doesn’t really matter what kind of business you’re in, every business needs to have a plan to keep their floors and entrance ways clean and safe. Using a regular mat rental service is one of the easiest ways for businesses to manage floor maintenance. At the same time, the mats will look professional, keep customers and employees safe, and cut down on labor costs for cleaning. Understandably, business owners often have a lot of questions when it comes to deciding to work with a mat rental company and making the decision to utilize floor mat rentals or industrial rental mats. In order to help business owners get a better idea of what it is like to work with a mat rental service, we’ve broken down the process to shed some light on what to expect. Whether standard mats or custom mats would be the best option in order to cover floor space adequately in a safe and practical way. Mats that don’t fit the space properly can result in uneven surfaces and excess tripping hazards. The type of mats that would best suit the needs of the business. It is important to note that choosing the right type of mats make a big difference in the results you can expect. Industrial rental mats perform differently than a more typical floor mat and specialized mats such as Waterhog mats or anti-fatigue mats serve a specific need depending on the type of business. Floor mat rental options are plenty, which is just another reason to work with a mat rental company so that you can be assured that you have the best mats for your needs. Choosing logo or message mats for your entrance or other areas in order to elevate and support your brand messaging. There is no upfront investment in mat inventory that needs to be made. You will receive fresh and properly laundered mats delivered promptly based on the schedule agreed upon. You or your staff is not supposed in any way to clean or maintain the mats. 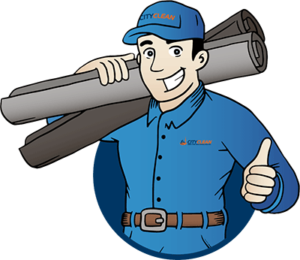 You will have the ability to change your mat needs and your delivery schedule as needed. Using a mat rental company means flexibility! You can change your mats based on seasonality, events or promotions or when you add or change the way your business functions. You will have access to ongoing customer support. 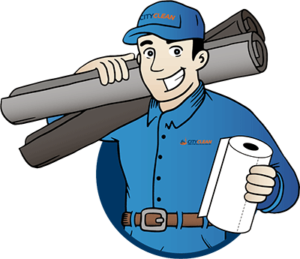 Not only are City Clean floor mat rental experts just a phone call away, but we also offer an online client portal that makes it even easier for our customers to manage their needs. Using the right mats will help keep 85% of the dirt brought into your business trapped at the entrance way. Knowing the safest type of mats to use will also help to limit potential slip and fall accidents. These two benefits, combined with reducing the time and energy you are currently using to manage your own mats, make the decision to call a mat rental company an easy one. 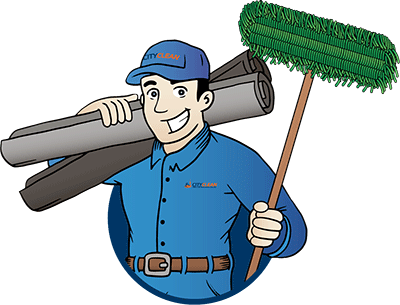 City Clean would be happy to help you get your floor mat rentals underway – give us a call at 1-877-649-7747! ‹ Why Hire An Office Cleaning Service?